In Denmark's Plan To Rid Country Of 'Ghettos,' Some Immigrants Hear 'Go Home' : Parallels Officially designated as "ghettos," 25 areas with a high percentage of immigrant residents will be abolished. The government's goal is integration. "What they mean is 'go home,'" one immigrant says. 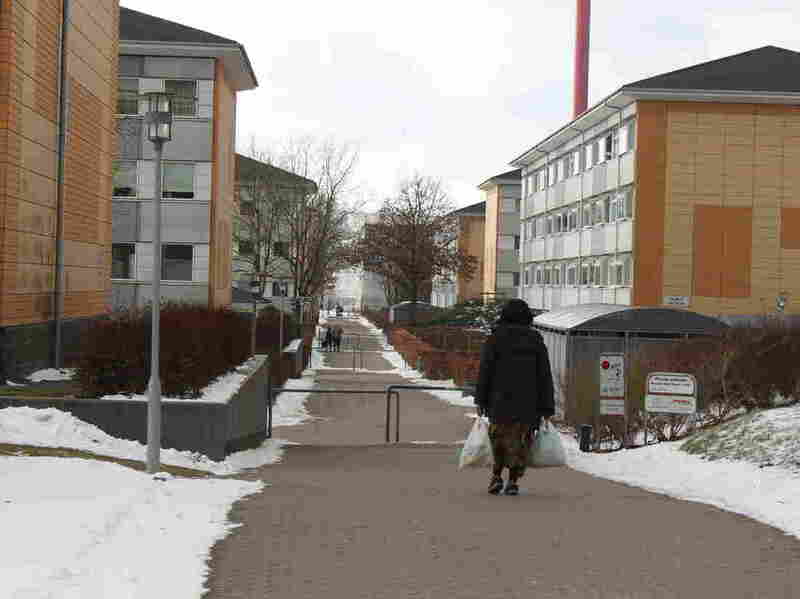 A woman walks in Skovparken, an officially designated "ghetto" in the Danish city of Kolding. In a move aimed at ensuring an integrated Denmark without "parallel societies" and to protect "Danishness," the Danish government recently released a plan to rid the country in the next 12 years of areas it officially calls "ghettos." Political leaders refer to these areas as "holes in Denmark's map," where Danish language and values are lost to generation after generation of residents. Because these neighborhoods are dominated by apartment buildings with cheap rents, refugees on "integration support" have often been placed there by public authorities. But many immigrants choose to live there on their own. Prime Minister Lars Løkke Rasmussen says that while the number of first- and second-generation, non-Western immigrants has grown from 50,000 in 1980 to almost 500,000 today, "people with the same problems have clumped together, [and] we have let it go, perhaps with the naïve idea that integration would happen on its own over time, because this is such a great country with so many possibilities... But it hasn't happened. The problem has grown." It's not the first time the government has launched a strategy to abolish ghettos. In fact, there have been several in the last two decades. But rather than issuing broad-brush decrees, as has been tried in the past, this time 13 of the plan's 22 initiatives apply only to ghettos or similarly defined "vulnerable areas," and the people who live there. A few days after the plan's release, Idil Ahmed emerges from a supermarket in the city of Kolding. In this market, located in the heart of one of the city's two designated ghettos, the shelves are lined with za'atar, okra, makdous — imports that would be hard to find in a typical Danish grocery store. Ahmed hesitates a moment before putting down her three bags. Ahmed says she hasn't read the entire government plan, but she understands the premise: one set of rules for the rest of Denmark and a different set for her and her neighbors. "You must do this, you must do that," she says. "What they mean is: 'Go home.'" Ahmed says she's considering it, even though she has a job and three grown sons, all born in Denmark. "Even though I came as a child," she says, "I think, 'This is a bad feeling. I cannot grow old in this country.'" "See him over there?" he says, lowering his voice. "He doesn't do anything. He just gets money. They just want money." Even opponents of the plan, who tend to favor a more carrot-based approach, agree that unemployment is a very serious problem in Denmark's ghettos. According to the government, a third of non-Western immigrants have been out of work or school for four of the last five years. That said, what may be most surprising about this plan is how little criticism it faces, especially from the country's largest opposition party, the center-left Social Democrats. It's part of a growing European trend that is particularly evident in Denmark: Social Democrats are taking a harder line on immigration as they try to win back working-class voters who have veered toward nationalism. Shortly after President Trump won the Republican nomination in 2016, Danish Social Democrat leader Mette Frederiksen crafted a prescient Facebook post: "We have to admit that the people he speaks to are feeling heard for the first time in a long time, and have been missing a voice that puts words on their fears and frustrations." "Every single morning, you listen to the radio or you read the media, it's just about us [the immigrants]. All the time. 'We shall do this, we shall do that.' Why don't they just say 'get out'? I think that would be better," he says. "People are tired of this. We are tired of this." Said says ultimately it doesn't matter whether the government uses carrots or sticks. Gesturing toward the high rises all around, he says that until Danes take a hard look in the mirror, nothing will change. "Twenty-five years ago, the people living here, they were all Danish people, white Danish people," he says. "If they do it again, and they move Somalis to another place where there are only Danish people living, they're going to do the same, the Danish," Said says. "They're going to leave."